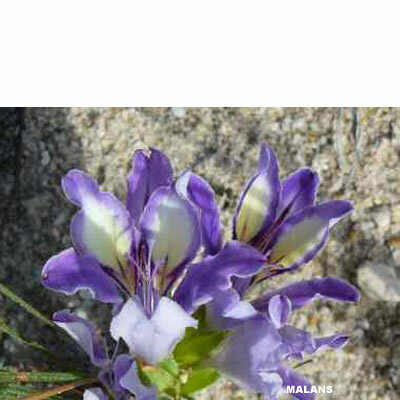 Babiana ambigua (Iridaceae) It is a winter growing bulb, found on sandy flats and slopes in the South African Cape. It is easy to grow in the garden. It makes rather large, blue, sweetly fragrant flowers with light yellow inner markings. Sowing : Seeds are sown in autumn, in deep pots, seed trays or raised seed beds. The seeds should be sown thinly to prevent overcrowding and the development of damping-off fungi, and kept moist by regular watering using a watering can fitted with a fine rose cap. Seedlings should remain undisturbed for two years, then potted up into permanent containers or into the garden at the beginning of their third season. Locality : Clanwilliam. Date of harvest : Dec 2018.